Gray wolf doesn’t want to be gray anymore. He thinks gray is such a boring and dreary color. So, he came up with an idea: he would change his color! Each day of the week starting with Monday, Wolf changes his color from green to blue and even dressed himself up in peacock feathers! Will Wolf ever find the perfect colour? This book is a tale of acceptance and self-esteem. 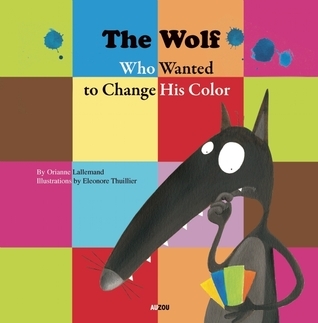 Wolf tries and tries to find a suitable color for his coat, but realizes in the end he is happy just the way he is. This book is perfect for kindergarten and up. It combines concepts (days of the week, colours) with a lovely message at the end. Perfect for a classroom storytime session.